1. How will Michigan State cope without Valentine? **There are a lot of high-usage players in the Big Ten, to be sure, but no player consumes as many possessions for his team as Denzel Valentine. Not only that, but the senior also happens to be the most efficient player in the Spartans' rotation. There's no one person that can replace Valentine, perhaps in all of college basketball. Certainly there's no one else at Tom Izzo's disposal. So how will the team change? It won't be a cakewalk over the next couple of weeks, either, as the Spartans will face a Tournament-caliber Oakland team tonight before beginning conference play. The good news is that Valentine should be back before MSU faces either Purdue or Maryland, the would-be challengers to the title, so Izzo's team still figures to be the team to beat. 2. Is Northwestern any good? **The computers haven't liked the Cats this much since the John Shurna/Drew Crawford days. But by the end of January in those seasons, the Cats were staring up at the Big Ten standings, and never reached .500 in conference play. And really, with this year's non-conference schedule (per Pomeroy, one of the 5 easiest non-conference schedules of any power conference team), that is likely a hard requirement for reaching the Dance. That's no small feat at this school—the last time a Northwestern team went .500 in the Big Ten and also had an overall winning record was 1968. This year's team seems like it can get there, but it's only played one team in the Pomeroy top-100 (and lost by 11). What's more, three of the cupcakes took the Wildcats to overtime (though two were true road games). On the other hand, Northwestern is uncharacteristically strong on two-point offense and two-point defense, which are difficult things to fake, even this early in the season. 3. How big of an upset will Ohio State's win over Kentucky be come March? **Sure, the Wildcats led a spirited run that brought them to within three points of the Buckeyes, but make no mistake—for much of the game OSU was running a clinic. And it would have been ugly but for what could be the best game of Jamal Murray's brief collegiate career. 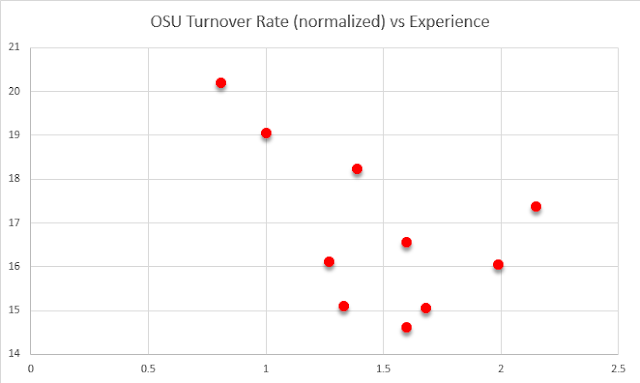 Historically (and by that, I mean as far back as Pomeroy has experience data, which is the 2006-07 season) OSU has minimized turnover problems when the experience has been 1.5 seasons (weighted for playing time). Between 1.0 and 1.5 has been a mixed bag, and 1.0 and below (this season is the upper left) have been problematic. Maybe this is a real trend, maybe not, but turnovers are clearly the weak link of this team. We saw how good the Buckeyes can be when they take care of the basketball—if they keep doing that, the Kentucky win could bolster the case for a protected seed, rather than for a spot in the play-in game. 4. Will anyone counter Purdue's skyline defense? **Purdue is the tallest (by Effective Height) team in the country that does not feature a 7-6 player in the rotation, and the two-point defense speaks to that. The Boilermakers are holding opponents to just 36.7 percent shooting inside the arc, which is bolstered by the fact that Purdue's overplay defenses generally encourages more 2s. Indeed, teams are not shooting many 3s against Purdue, nor making them (27.3 percent). In Purdue's sole loss, Butler managed to eclipse the PPP mark not just by minimizing turnovers (which is no great feat against Purdue), but also by drawing plenty of fouls (though oddly, not against the big men). The good news for Purdue is that the only team that fits that profile in the Big Ten is Minnesota, and I don't think the Gophers are up to the task. **There's no way to sugarcoat this—it is highly unlikely Gard will be able to replace Bo Ryan. I say that as no slight to Gard, but as a compliment to Bo. Prior to Ryan, Wisconsin had 6 seasons since 1960 with an above-.500 winning percentage in the Big Ten. Bo did that in each of his 14 seasons in Madison. Mike Krzyzewski gets a lot of deserved praise for building the Duke program into the monster it is today, but even before Coach K arrived, Duke was perennially an ACC power (albeit not an annual national title contender). Wisconsin, on the other hand, was a basement-dweller of the Big Ten. For example, between 1981 and 1988, the team finished no better than 6-12 in conference play, winning a total of 34 Big Ten games across 8 seasons. There's simply no precedent for the transformation of the program under Ryan. Having been Bo's assistant for 23 years, it's hard to imagine that we're going to see a brand new style of play that's been repressed by Gard for over two decades. It will likely be the same 4-out, 1-in triangle set offense, and a strong rebounding defense that encourages long 2s. But just because Wisconsin will continue to try to do the same things does not mean it will achieve them as it did under Ryan. That's where Gard will have to show he's worthy of removal of the "interim" label.